You are here: Home > Legacy Toys in Minnesota and North Dakota is March’s Store of the Month! 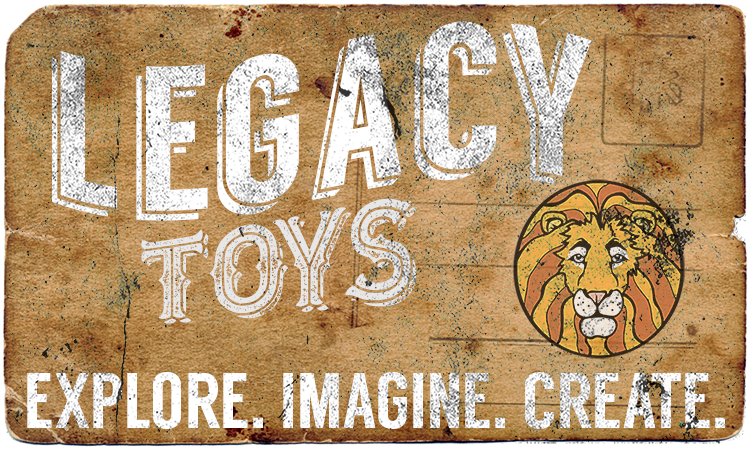 We are so excited to have Legacy Toys as our March Store(s) of the Month. With three locations around Minnesota and North Dakota, these shops are definitely leaving a huge legacy! 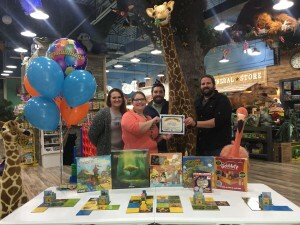 The Blue Orange team got the chance to visit the Duluth location and loved how knowledgeable the staff was, as well as the passion they had for our games. In fact, after getting the chance to play the 2017 Spiel De Jahres winner, Kingdomino, with our Blue Orange interns, it quickly became a staff favorite. 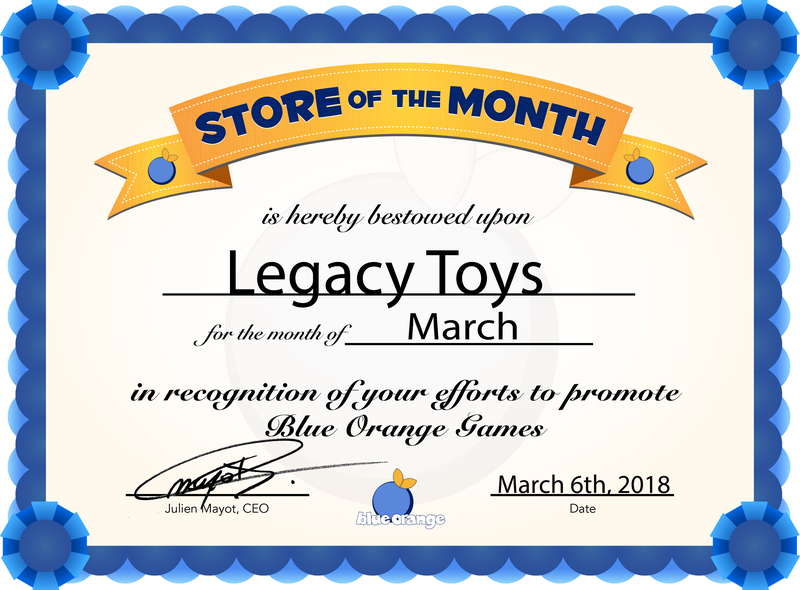 In addition to all the fun we had while visiting, this enthusiasm for Blue Orange Games is why we are so happy to reward Legacy Toys our Store of the Month award! Brad and his wife opened their first store in 2012, wanting to bring fun to kids and families with their unique ideas. The first Legacy Toys was in Ely, Minnesota and was filled to the brim with toys, games, and plush figures that were perfect for igniting imagination. Brad and his wife have three daughters, so they wanted to help families like theirs appreciate quality time together without all the distractions of electronics. At Legacy Games, it’s always encouraged to think creatively, explore, and of course- PLAY! For the fantastic staff at Legacy Toys, playing games is taken very seriously, and Brad’s team always goes above and beyond as game experts. This is part of the Legacy Toys experience- customers always return because they know just how knowledgeable the staff is. Brad even started a rewards program just for his staff, so that when they can successfully teach someone how to play a new game they are rewarded points. 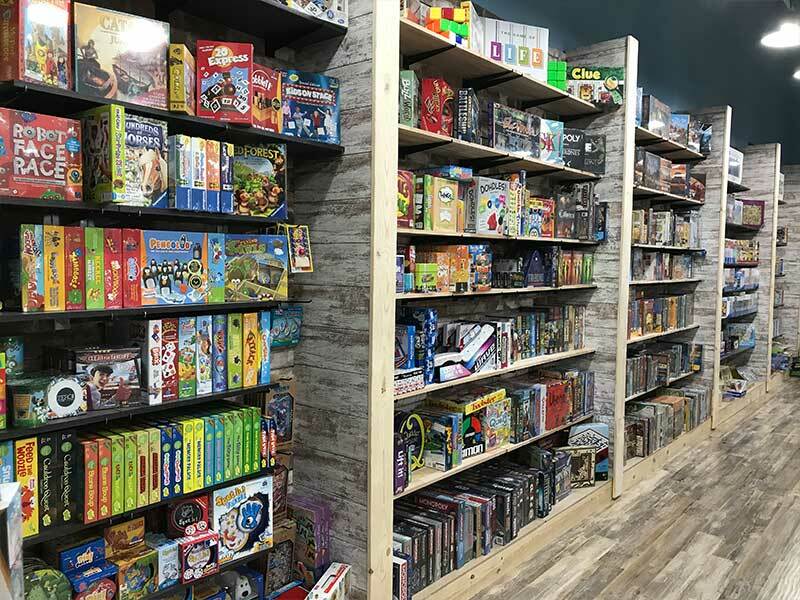 With access to over 400+ games in the Legacy Toys demo library, everyone is free to bring games home and encouraged to pick out a quarterly favorite to show off to the customers. It’s clear that there’s no lack of passion from the staff, owner, or customers at Legacy Toys. 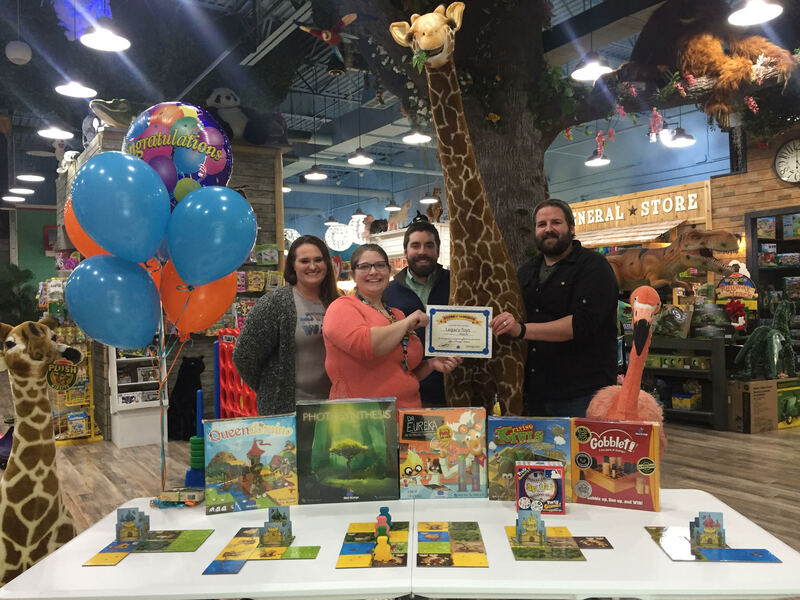 The team at Legacy Toys, Duluth receiving the Store of the Month award. 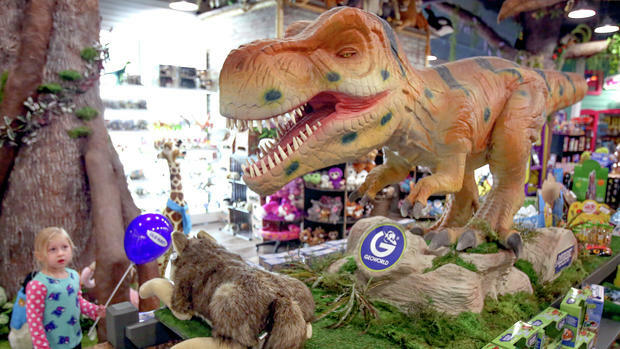 With three stores already open in the area, Legacy Toys has become a sought after adventure for many because of its remarkable decor. The third store in Fargo just opened in November, and it features a life-sized bison that entices locals and tourists alike. Additionally, every Legacy Toys is home to a giant, robot dinosaur- each has a distinct species to greet you inside! At the Ely store, you’ll be sure to find fun with their 500-gallon saltwater aquarium that’s filled with all the mysteries of the sea. Last, but surely not least, is the Duluth store. It not only has a full castle storefront entrance, so you can arrive like royalty, but it also has a rain forest set up with twenty-five foot palm trees and LED clouds to stimulate storms. At this location, kids love to ride the Plasma Car around the store or even sneak into the candy section for a sweet treat. 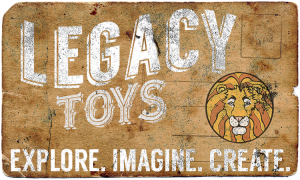 If you can visit all three Legacy Toys, or even just one, you’re sure to have an experience like no other! All the stores have events, such as bi-weekly game nights, where you can expect more than 100 people to stop by and play a few rounds with friends, both old and new. One of the crowd favorites is Dr. Eureka, since it’s so easy to join in on a game with kids of any age. 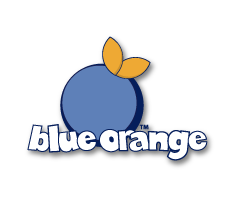 This event is also an amazing opportunity to try before you buy and get familiar with all the new Blue Orange, like Pool Party or Mindo. Make sure to check out the Legacy Toy store website to see when the store closest to you is having an event! 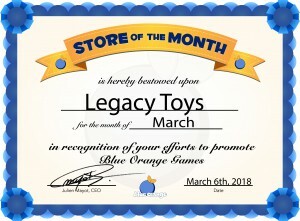 Congratulations again to Legacy Toys!